Caring Kirsty helps Kenya get cooking! Kirsty Priest embodies our company values inside and outside of work, as she tirelessly volunteers and fundraises to help homeless people in Nairobi. At Bizspace our company values are professionalism, teamwork, honesty, passion and fun. A member of our team who embodies each of these values just as much outside of work as in it, is Kirsty Priest, Marketing Assistant at our BSS House in Swindon. 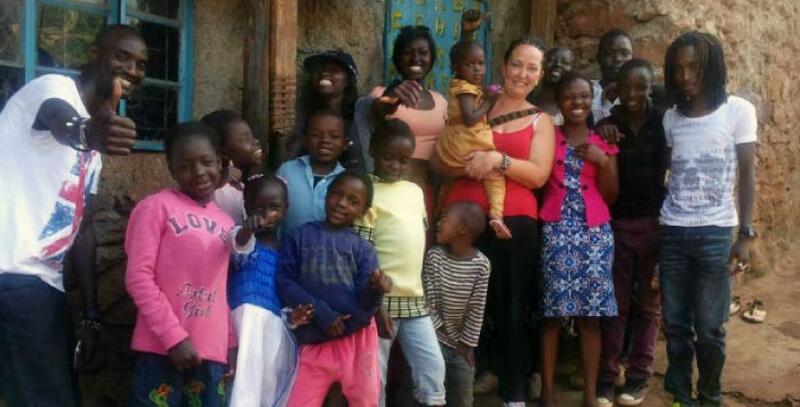 Last year, mum-of-two Kirsty realised a lifetime ambition to volunteer in Kenya. Since then she has dedicated her annual leave to travelling back to the country to help feed street children and keeps busy organising regular fundraising events in Swindon to help improve life for Nairobi’s homeless young people. She says although it’s difficult to miss out on spending time with her children, aged seven and five, during school holidays, it is worth the effort to make a difference. “I first went to Kenya in May last year and volunteered teaching at an orphanage, which was something I’d always wanted to do,” says Kirsty, 34. Her first trip was organised through a company who specialise in volunteering trips, but while she was in Africa Kirsty met some organisers of Street Life Care, who work with homeless children and young people in Kenya. Kirsty organised her own trip to Nairobi in December to help Street Life Care deliver feeding programmes and became involved in setting up a bakery in nearby Maai Mahui. “The second time I went I came away feeling like I had really achieved something and made a difference to people’s lives – people who had no homes or food,” she says. Kirsty, who has worked at our BSS House business centre since last year, will be travelling back to Kenya on 28 May and hopes to have raised enough money by that time to buy an oven for the bakery, which is considered a luxury item in the country. The bakery helps provide food for hundreds of people in the area, with a team of just eight staff. “I’ve already raised enough for the bakery’s electricity to be installed and now the target is to raise £350 for the oven, which will make a huge difference,” says Kirsty. As well as organising a fundraising fashion show with the help of friends and doing supermarket bag-packs, Kirsty is planning a charity reggae night in Swindon and is currently being sponsored to live below the poverty line for a week – surviving on just £1 a day. “It’s harder than I thought it would be!” she says. After her trip in May, Kirsty plans to visit Kenya again in the new year and will continue to help raise money to support the work of Street Life Care. You can sponsor Kirsty online http://www.gofundme.com/ncz8gg to help her towards her current target. For more information about the offices, workshops, studio space or light industrial units available for rent at our BSS House, you can contact Business Centre Manager, Jane Kirk, on 01793 613 456 or email [email protected]. The business centre has excellent transport links and free of charge car parking facilities, and is celebrating its 30th anniversary this year!